We’ve been pretty luck this year when it comes to the pests. For the most part they are all staying out side, (and I’m knocking on wood right at this moment so I don’t jinks that!) however our back patio is a little busy with ants. It’s not quite an infestation, but it gets annoying when you’re sitting out there enjoying a nice cup of iced something and ants start crawling up your legs. Ick! 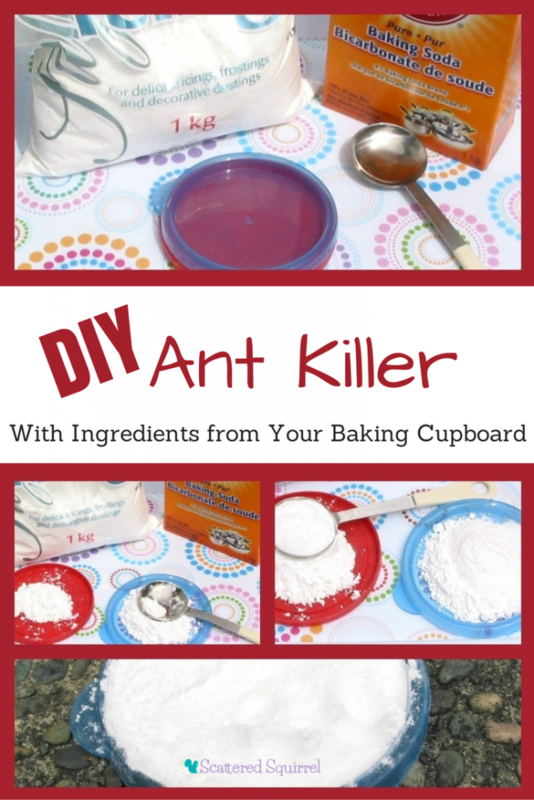 Then as I was browsing Pinterest yesterday, I came across this great idea for a DIY Ant Killer. The best part was that it used only two ingredients that I already had in my baking cupboard. It was really easy to whip this up. Simply mix equal amounts of baking soda with icing sugar. It MUST be icing sugar because the powder is so fine that it makes it impossible for the ants to get it and not take some baking soda with them. The baking soda is what is going to get rid of those pests. Their stomachs cannot digest it properly and it kills them. I mixed mine right up on the lids. We placed the lids on the patio, and sprinkles some of the mix onto areas we noticed the ants seemed to like. I did this a few days ago so I would have something to report back. Yep, it works! This DIY Ant Killer isn’t as fast acting as some of the chemical sprays you buy, but it does work. At first I was a little worried because it seemed to be attracting more ants, but I think that was the sugar in the mix. After a few days we noticed that the ants weren’t as numerous on the patio. So while there are still ants, their numbers are dwindling, and I’m sure as time goes on they will only shrink more. 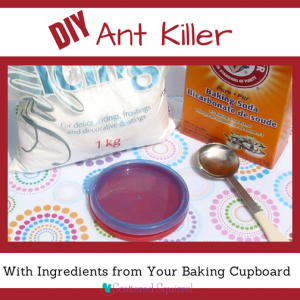 So, if you’re looking for a way to get rid of ants, look no further than your pantry! 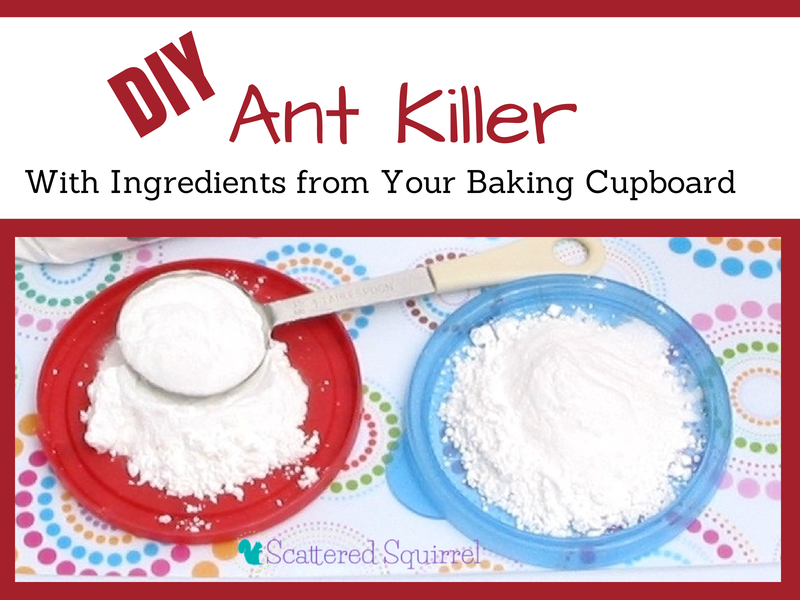 If you’re looking for a way to get rid of ants, look no further than your pantry! 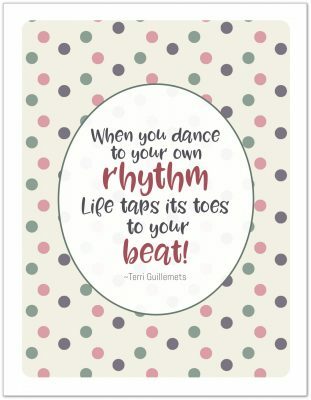 What DIY tricks have you been using? Have you ever found a tip on Pinterest and actually tested it out? If not you really should!